The North of the BaGua is Kan Gua which means Water. It represents movement of our change. To represent this Gua is one solid line (Yang) in the middle and two broken lines (Yin) on the top and the bottom (using Yin Yang). The energy of Water moves downwards, just as water moves to the lowest level in nature. The power of this energy is dark, deep and cold. This Area is also called Traveling Area, which represents our movement through life. It affects not only our career but also the position of our living. This area belongs to Water Energy. The colors to use in this area are deep blue and gray, which presents Water element. You also can choose gold or silver color which represents Metal element since Metal generate Water. The tone of brown or yellow color, which represents Earth, can annihilate Water. The South of the BaGua is Li Gua which means Fire. It represents something that illuminates us. Its natures are enlightenment, vision and understanding. The represent this Gua is one broken line (Yin) in the middle and two solid lines (Yang) on the top and the bottom. The energy of Fire rises up. Its clarity and vision presents illumination. This Area is also called Illumination Area. If you don't feel inspired, maybe there is something wrong with this area. This area belongs to Fire Energy. The colors to use in this area are red which represents Fire element or light green which represents Wood element which generates Fire. Since Water extinguishes Fire, the tone of deep blue and gray, which represents Water, can wipe out the Fire energy. The East of the BaGua is Zhen Gua which means Thunder. It represents something that comes before us. To represent this Gua is one solid line (Yang) on the bottom and two broken lines (Yin) on the top. The energy of this Gua is like the sudden release of stored energy. This Area is also called Elder Area. It is associated with sound. If you have the problems with the noise sound, such as noisy neighbors, calm down this area's energy. It is also associated with the family. You will get bad relationship with your family if this area is missing. This Area belongs to Wood Energy. The main color of this area is greens. It signifies animation and movement. You will be benefit by displaying tall shapes and plants. Green, blue and grey can add the area's energy. On the other hand, white, gold, silver and metallic colors can turn down this area's energy. You can display one set of three gods which represent elder, power and harmony in this area. In addition, one green jade peach plant will increase wood element. The West of the BaGua is Dui Gua which means Lake. It represents fresh, free-spirited and joy. To represent this Gua is one broken line (Yin) on the top and two solid lines (Yang) on the bottom. This area belongs to Metal Energy. The main colors in this area are gold, silver, white, and anything shiny that associated with Metal energy. Brown color, which represents Earth, can be a support since Earth generates Metal. On the other hand, red color will weaken this area's energy because Fire destroys Metal. If you want to increase the metal energy in this location, you can display something metal or gold color here. Northeast of the BaGua is Gen Gua which means Mountain. It represents tranquil and stillness like a mountain. To represent this Gua is one solid line (Yang) on the top and two broken lines (Yin) on the bottom. This Area is also called Wisdom Area because mountain is about meditation and inner knowledge. It has the solid and heavy qualities. Thus anything that carries these qualities, such as furniture and big vase, can display in this area. If this area is missing, you will feel insecure. This Area belongs to Earth energy. The Colors to choose in this area are browns or yellows which represent Earth. You can choose some porcelain yellow items, such as Vase with Pandas and Birds or Wealthy Vase with Double Lovely Birds, displaying in this location. Red color is fine because Fire generates Earth. On the other hand, green color will lessen this area's energy since Wood destroys Earth. Northwest of the Bua Gua is Qian Gua which means Heaven. It represents creative and dynamic aspect of the life. To represent this Gua are three solid lines which are the maximum power of Yang. This Area is also called Authority Area because it is associated with strength, power, leadership and achievement. If this area is missing (missing area), you will find you lose power and authority. You will lose the support from your friends too. You can display one gold Ru Yi or one gold color money tree in this location. This area belongs to Metal energy. The colors to choose are same as the Creativity Area (West position). 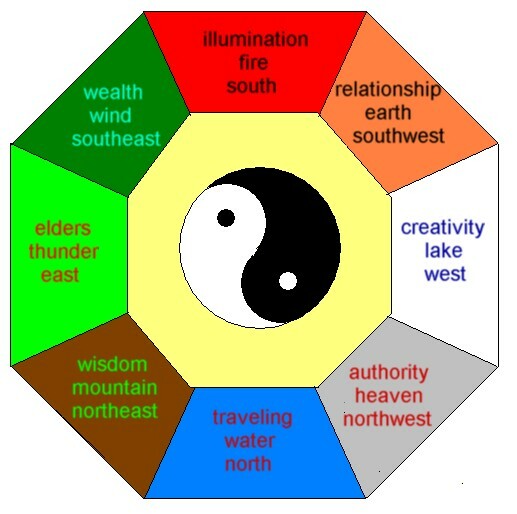 Southeast of the BaGua is Xun Gua which means Wind. It represents growth, maturing. It is invisible but irresistible. It is associated with fortune. To represent this Gua is one broken line (Yin) in the bottom and two solid lines (Yang) on the top. This Area is also called Wealth Corner. If the area is occupied by bathroom or toilet, you will face financial problem. In addition, anything heavy in this area will hurt your fortune. Displaying green color money frog(s) and hanging one green color crystal ball in this area will be helpful. It belongs to Wood Energy. The colors to choose are same as the Elder Area. Southwest of the BaGua is Kun Gua which means Earth. It represents openness, yielding and invitation. To represent this Gua are three broken lines which are the nurturing energy of Yin at its fullest. This Area is also called Relationships Position. If your relationship is bad, it means that there is something wrong with this area. Honey Birds, Mandarin Ducks, Dragon Phoenix or Dragon Turtle in this area will improve your relationship. It belongs to Earth Energy. The colors to choose in this area are same as the Wisdom Area.